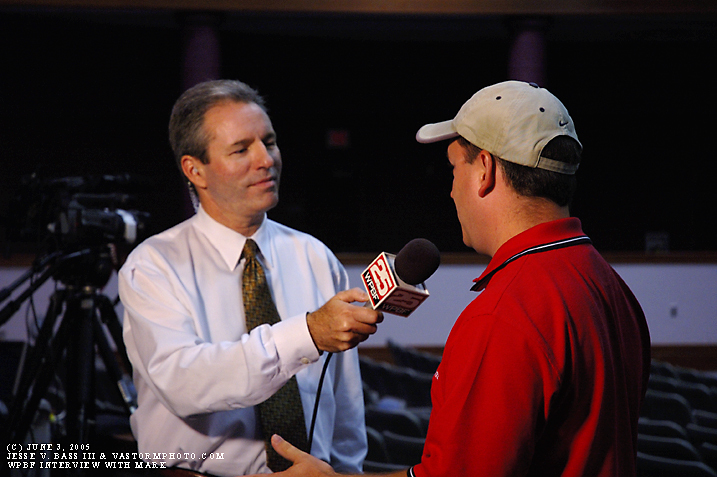 Mark Sudduth and I headed south to the sunshine state of Florida on the beginning day of the 2005 hurricane season. 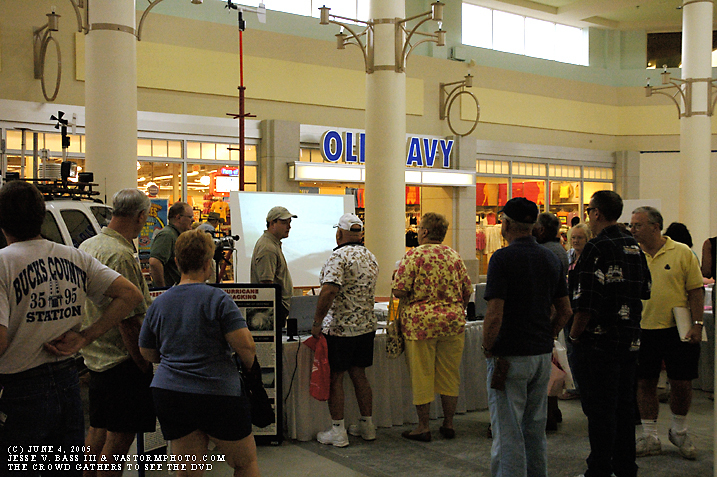 There was the 11th annual Hurricane Awareness Expo near Jensen Beach at the Treasure Coast Mall. First we would have a Town Hall meeting in Clewiston, Florida where in the hurricane of 1928 several hundreds lost their lives. Unfortunately not very many people turned out for the meeting. 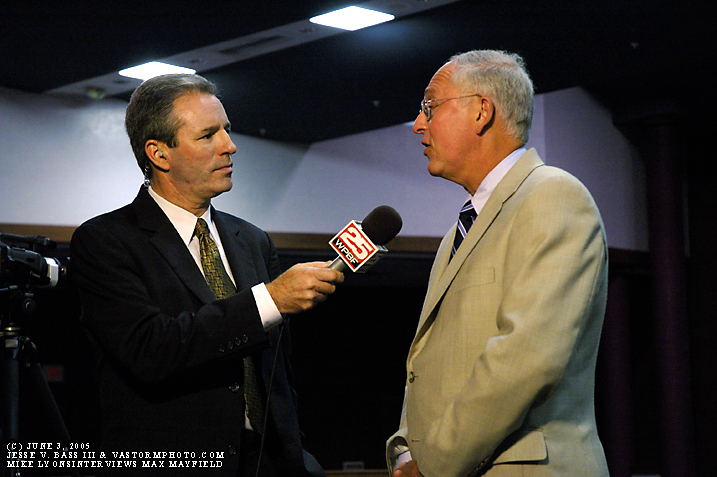 Mark was a guest speaker as well as several local folks from TV stations, local utilities and radio. 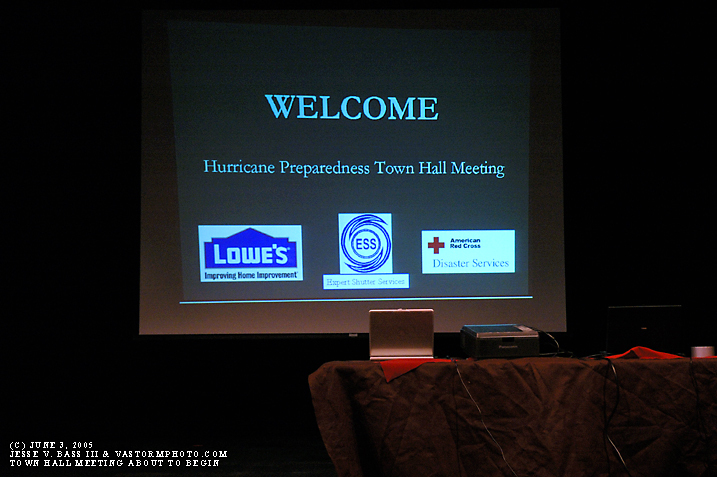 After leaving Clewiston, we went to Stuart, Florida where on Friday there was another Town Hall meeting where Hurricane Center Director, Max Mayfield was the key speaker. 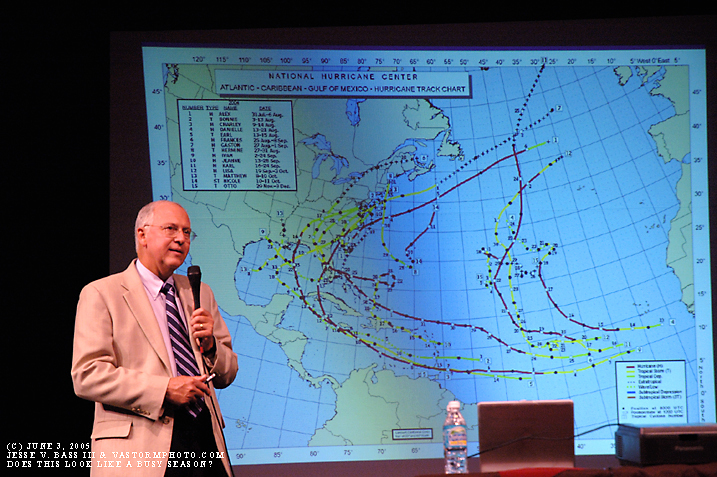 Stuart was the "ground zero" for two landfalling hurricanes last season, Frances and Jeanne. Mike Lyons the WPTF meteorologist was on hand to interview Max as well as a brief interview with Mark that aired on the evening news. 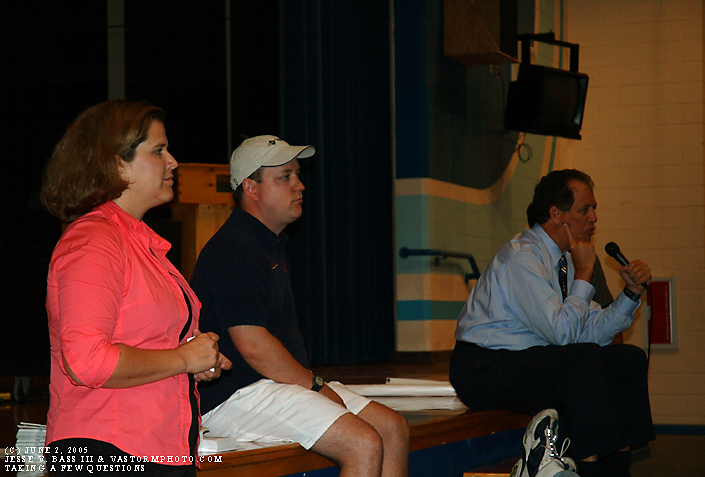 Mr. Lyons also introduced Max as the Town Hall meeting began. 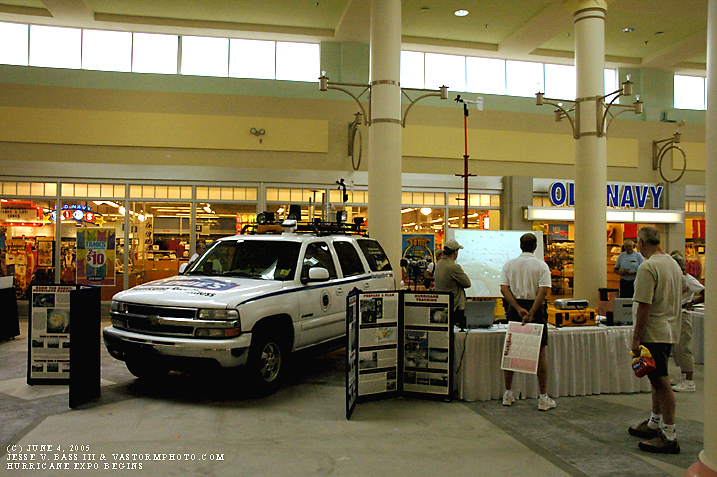 After the meeting was over, Mark and I had to go to the Treasure Coast Mall in Jensen just a few miles away to put the Chevy Tahoe and the new HLP Wind Tower inside the mall for the expo which began on Saturday and lasted till 6pm Sunday. Saturday morning, new H.I.R.T. member Mike Watkins joined Mark and I at the mall as the expo kicked off at 10am. From 10am till about 5pm it was non stop with people stopping by the booth to see the DVD which ran most of the day, and ask questions of us about hurricanes in general and if we were in the area for the two hurricanes that hit the area last season. At times we had 20-40 people at a time stopping to see the DVD as it ran during the Charley video and the Frances and Jeanne portions. We also met Jim Williams from Hurricanecity.com and Ross and Joel from Suncam.TV. It was great to finally meet those guys and a real pleasure to chat for several hours about all the activity from past seasons and what to expect this coming season. On Sunday, things were a little slower than on Saturday however it was still pretty busy. We also got to meet Mr. Mrs. Fuchs who let the team use their condo on Hutchinson Island during Frances. It was great to see them and they offered the use of their condo once again if we were in the area for another hurricane anytime soon. And once again the DVD was big hit. Without question the Expo was a huge success and we got to meet plenty of people that were glad to see the 2004 season end. Below are some photos taken during the trip. 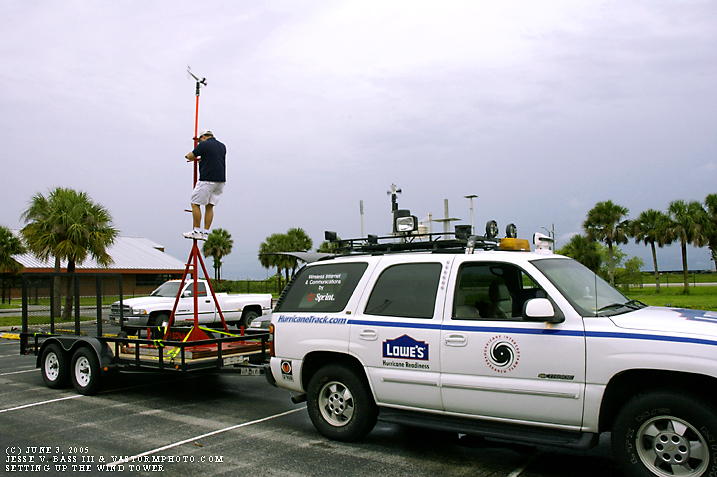 Outside the Town Hall Meeting in Clewiston, Mark sets the anemometer atop the new HLP wind tower. 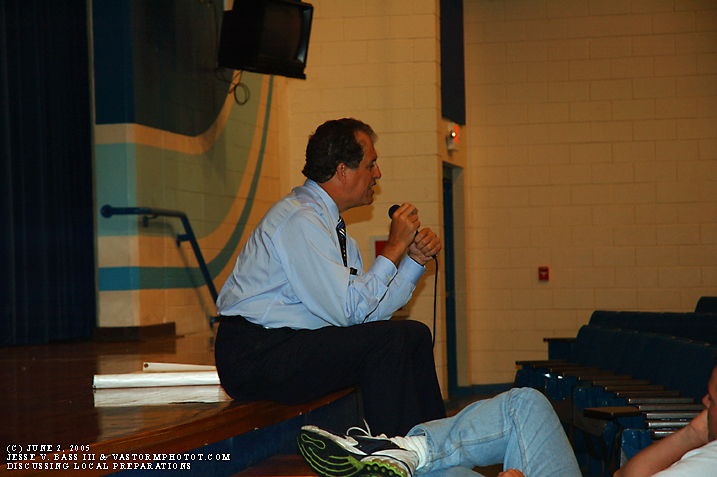 Mark starts his presentation once inside in Clewiston. 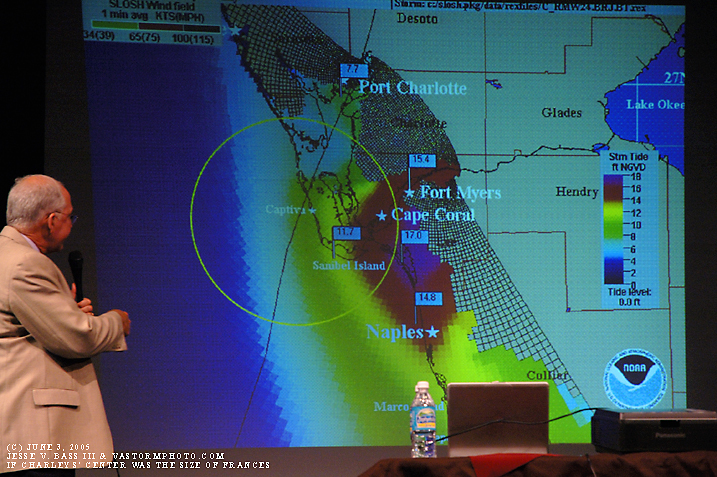 Here Mark points out our position along I-75 as Hurricane Charley was slamming ashore near Charlotte Harbor. 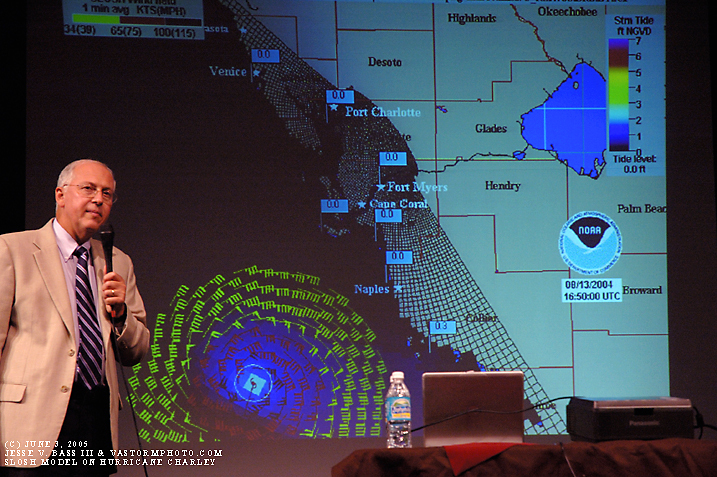 Here Jim Reif lead meteorologist from WZVN is talking about local preparations for the folks of Clewiston. After the speakers finished, they held a short question and answer session. WPBF meteorologist Mike Lyons interviews Mark for the 6pm news. Mike would be the host of the Stuart Town Hall Meeting. 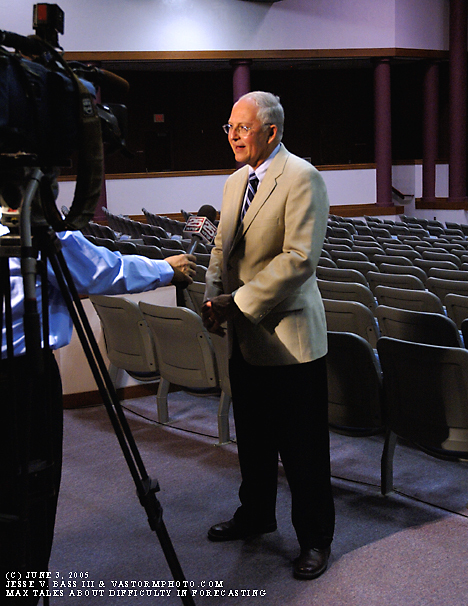 National Hurricane Center director Max Mayfield was the special guest at the Town Hall meeting on Friday night. 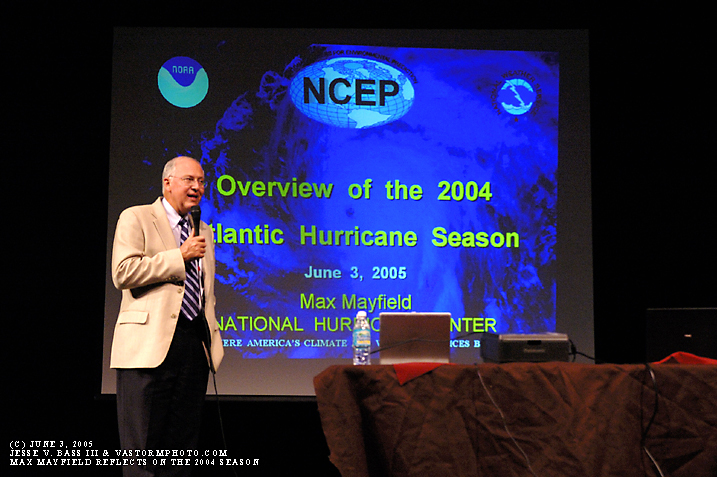 Here Mike Lyons interviews Max about the 2004 season and what we could expect in the 2005 hurricane season. Max is a popular person when it comes to hurricanes. Here he was asked about the skinny black line in the forecast cone of probability that became such an issue in the 2004 season. The meeting is about to begin. These were the sponsors of the event. 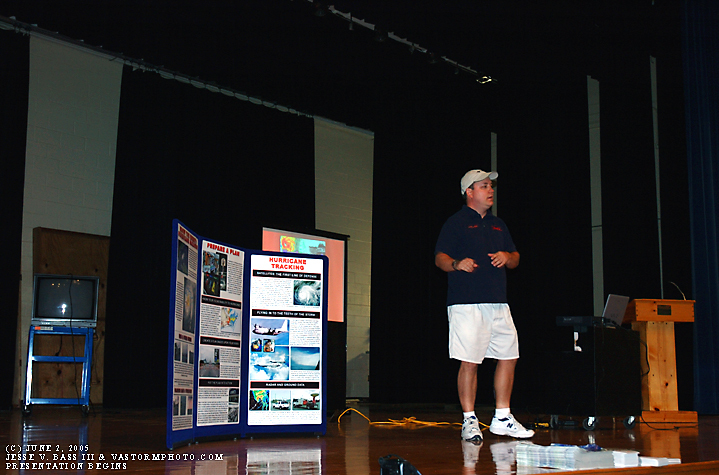 Mike Lyons shows the list of speakers for the two day event at the Treasure Coast Mall. 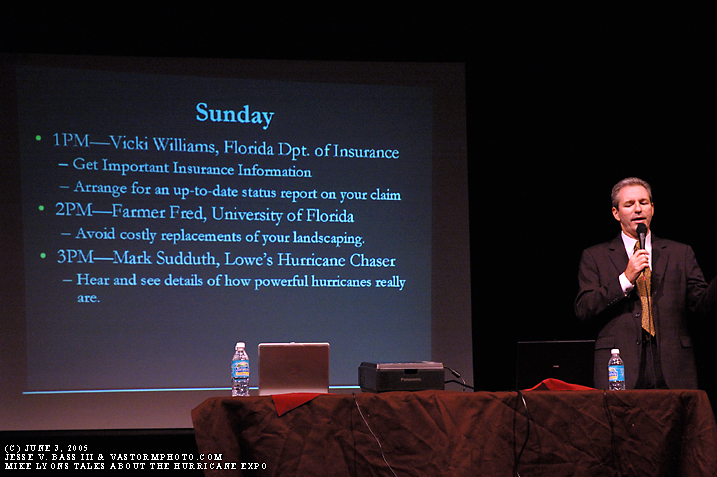 As you can see, our very own Mark Sudduth was due to speak on Sunday. 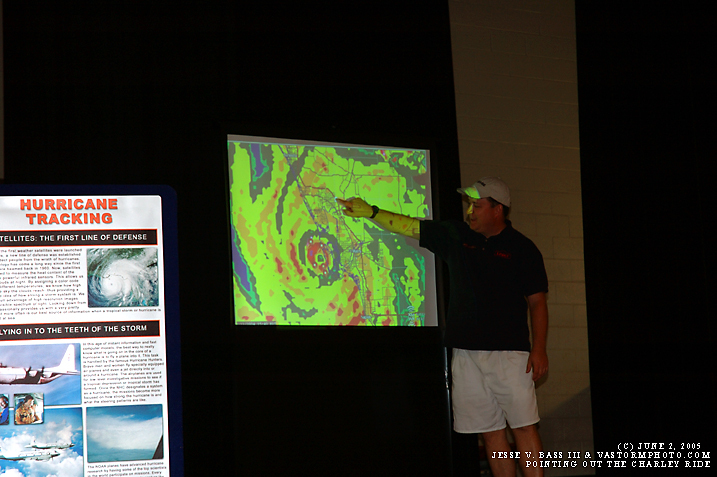 Max takes the stage and begins his recap of the very busy 2004 hurricane season. The look on Max's face pretty much says it all. Yes, it was a busy season with many of the storms striking the U.S. Here is a graphic from the "Slosh Model" which helps the forecasters with possible storm surge along the coast during a hurricane landfall. This graphic shows Hurricane Charley headed for Punta Gorda. This is a test if Charley's center had been as large as Frances. If Charley had had that large of a center with winds at 150mph when making landfall, you can see how the storm surge would have been devastating for Naples to Fort Myers, nearly 18 feet of surge COULD have slammed the coastline. 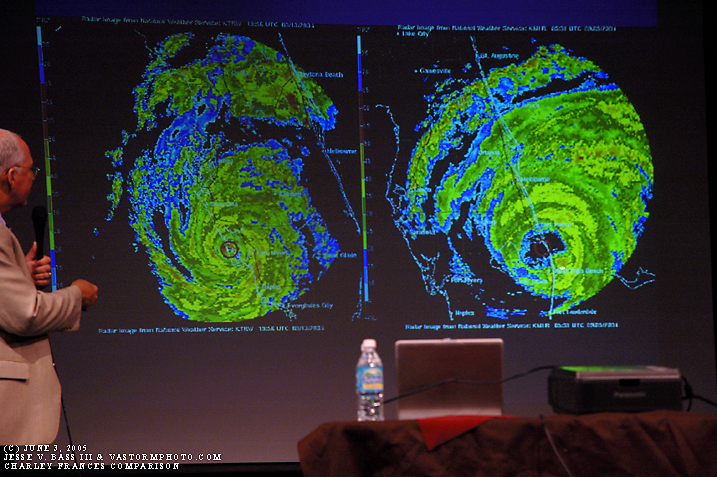 Here is a radar comparison of Frances to Charley near landfall. Notice how tight and compact Charley's center and core was to Hurricane Frances. Well organized as opposed to coming unraveled. 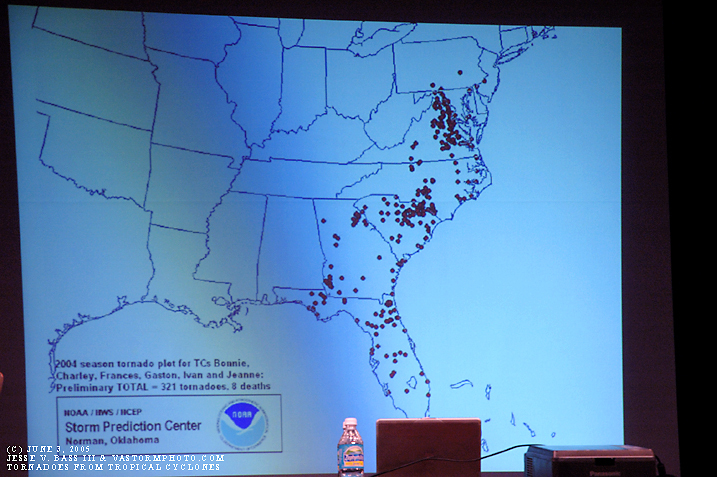 This graphic shows the number of tornadoes spawned by all of the landfalling hurricanes in 2004. There were 321 tornadoes and 8 people lost their lives due to these hurricane spawned tornadoes. 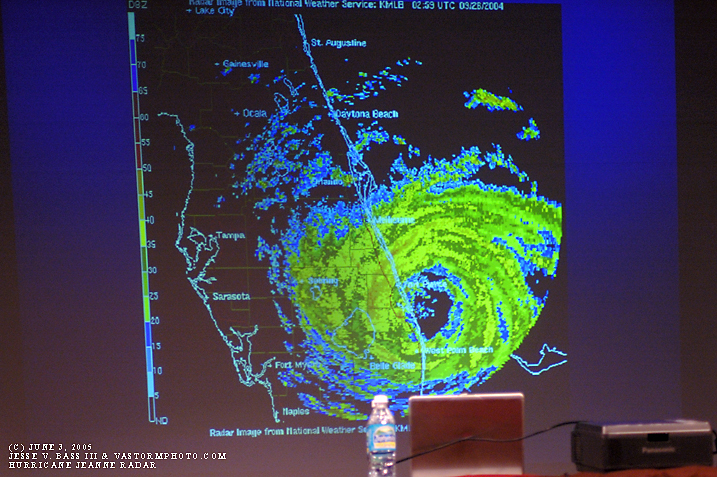 This is a radar image as Hurricane Jeanne was making landfall along the same stretch of coast as Frances just a few weeks earlier. This graphic shows the number of people who lost their lives as an indirect cause of the hurricanes. These people were not killed during the hurricane. 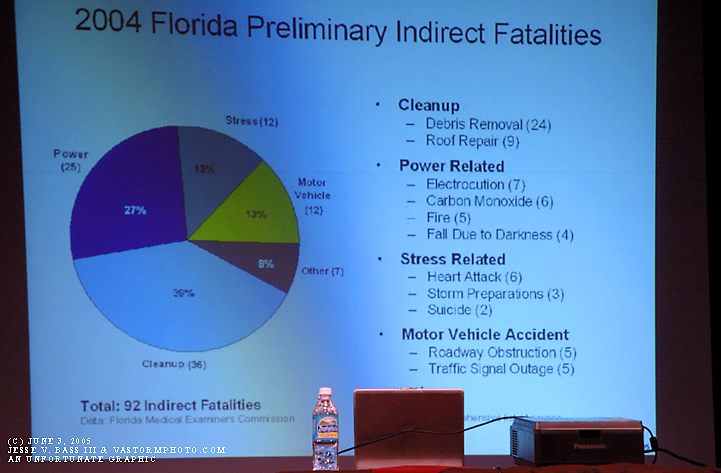 This shows the people who died in the aftermath and clean up effort or dealing with the stress of the storms. 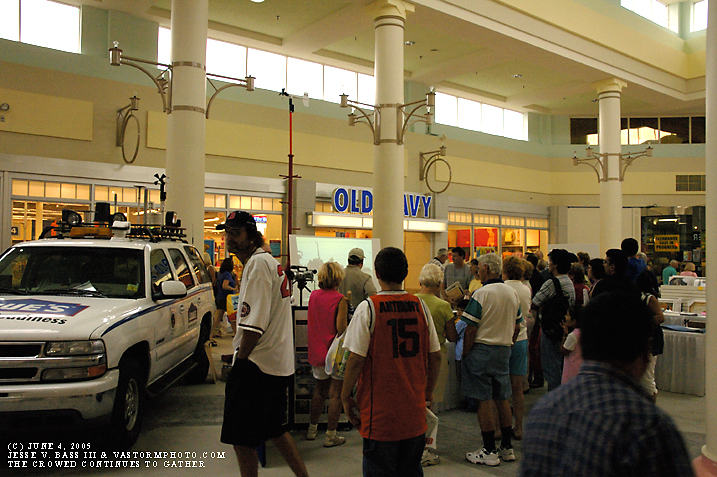 As the Treasure Coast Mall opens people were starting to gather around our booth to see the Tahoe, wind tower and the DVD. As the day wore on, we would get a new crowd of people who would stop by, tell us their stories and ask just what all the equipment was for. But the DVD of the 2004 season was the big hit at the booth this year. 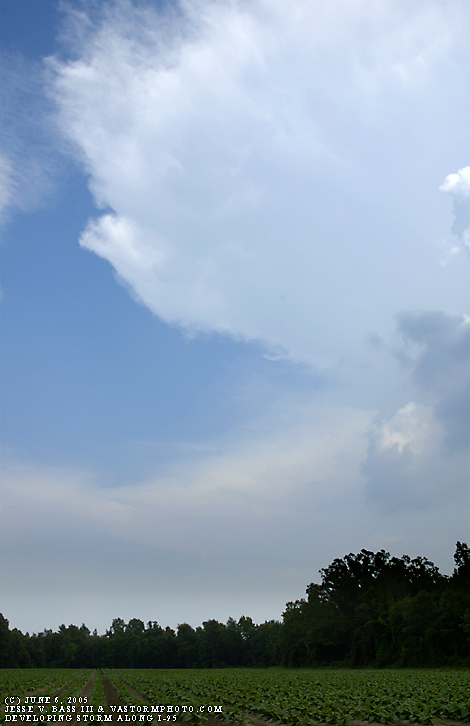 On the way home form Wilmington, NC, there were several storms that were developing and moving westward towards I-95. I pulled over to shoot a few photos of the storms as they approached. This photo was the last taken as the storms weakened and fell apart as they reached me along interstate. 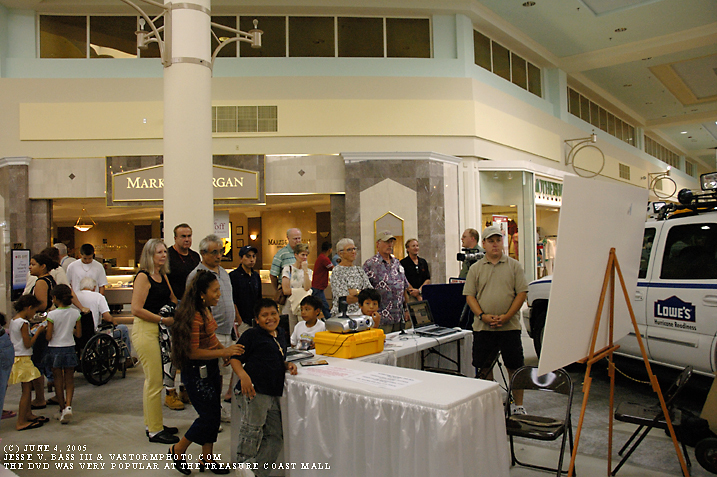 The treasure Coast Mall Hurricane Expo was a huge success. I would have to estimate that there were 40-50 thousand people that came to the mall over the weekend and I think that we talked to half of them, lol. We ran out of the Lowe's hurricane Readiness Guides on Saturday and we had close to a thousand of them. The American Red Cross had about a thousand of them to hand out as well and they ran out early Saturday night or Sunday morning. We look forward to next year and seeing the great people of Jensen Beach and surrounding areas.